AUCKLAND, New Zealand - No complacency - that's the message from the Navy Blues as they set their sights on Hawke's Bay United in their final ISPS Handa Premiership clash before setting off for the FIFA Club World Cup. 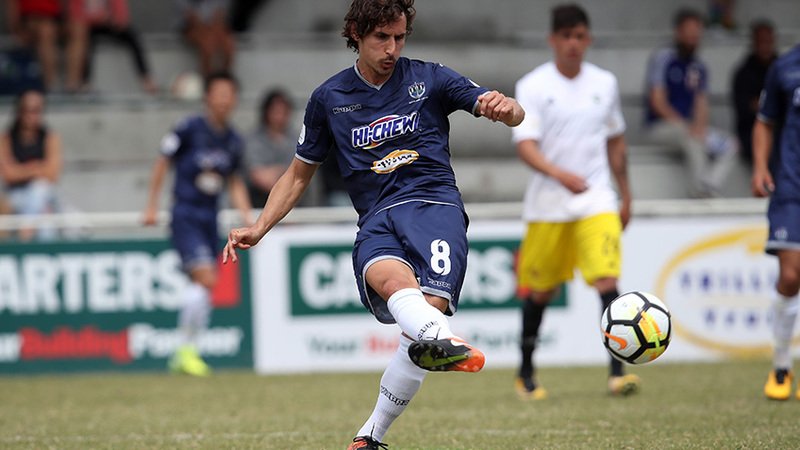 The Navy Blues are in a rich seam of domestic form having cobbled together four wins, a draw and one loss in their first six matches including a 6-0 demolition of Hamilton Wanderers and a 4-0 win over the Wellington Phoenix. But if there is one match that causes concern for Navy Blues supporters its always the last domestic game prior to a Club World Cup. Team Wellington handed the Navy Blues their record domestic defeat in November 2014 when they registered a 4-0 win at David Farrington Park. Coach Ramon Tribulietx admits thoughts of Al Ain and Al Jazira may be at the back of his players' minds but he's equally adamant they won't be thrown off their objective at Kiwitea Street on Saturday. "The players heads will obviously have that game in Al Ain in their minds somewhere but this team has always managed to compete well regardless of the circumstances. "I understand that our mindset might not be at our best but we will definitely be very focused on the task at hand and look to overcome that with concentrating on our football. "There are a few players that are hitting top form now and the new players are fitting in very nicely. The form of Callum McCowatt, Emiliano Tade and Ryan De Vries means competition for places is red-hot and that jostle will only intensify closer to the FIFA Club World Cup. Tribulietx considers himself fortunate to have such a rich talent pool to draw on with 21 goals notched in just six matches. Last season the Navy Blues struggled to match Team Wellington's relentless goalscoring form. "All goalscorers go through these periods of time where things don't come easy. Last year we managed to improve our conversion rate later on in the campaign and we also had a very tough run of games mid-week and weekend and trips overseas that hit our freshness too. "That is the price you pay when you are trying to compete for every single tournament you are in. "We are creating chances as we were last year, whether it is from build up play from the back like our first goal last weekend or via counterattacking and set pieces," he said. Hawke's Bay United have enjoyed success over the Navy Blues in recent times with last season's smash-and-grab 2-1 win at Bluewater Stadium still fresh in the mind. Tribulietx has the utmost respect for the Bay who he says always pop with a tactical surprise or two despite a high turnover of players. "The Bay have always been very competitive regardless of their personnel and that is a credit to them and their coach Brett Angell. "We need to make sure we understand how to play our possession game against that type of approach and which things we need to acknowledge positionally to penetrate their defence whether is higher or lower up the pitch. "I expect Saturday to be another very difficult game for us," he said. The Navy Blues may have another attacking option up their sleeve with former All Whites striker Kris Bright approaching full fitness. Mario Bilen and Owen Parker-Price are both ruled out with injury. Auckland City FC take on Hawke's Bay United at Kiwitea Street on Saturday 25 November 2017 with the match set for a 2pm kick-off. The Navy Blues depart for the FIFA Club World Cup on Monday 27 November at 6.15pm local time. Their playoff match with UAE champions Al Jazira is set for 6 December. AC (from): 1. Enaut ZUBIKARAI (GK), 2. Liam GRAHAM, 3. Takuya IWATA, 5. Angel BERLANGA (c), 6. Te Atawhai HUDSON-WIHONGI, 7. Cam HOWIESON, 8. Albert RIERA, 9. Darren WHITE, 10. Ryan DE VRIES, 11. Fabrizio TAVANO, 13. Alfie ROGERS, 15. Dan MORGAN, 16. Daewook KIM, 17. Reid DRAKE, 18. Danyon DRAKE (GK), 20. Emiliano TADE, 21. Harry EDGE, 23. Marko DORDEVIC, 24. Conor TRACEY (GK), 26. Callum McCOWATT.